Clicking on the names above will take you to that wrestler’s profile on Joshi City. Since I am watching the Stardom World version of the show, it will be shown in full but no multi-cam setup. In typical Stardom fashion, we start with a Rookie Battle. Arisu and Azumi are bitter rivals but team up here to face off against the newest rookies. I guess to show that the more experienced rookies still dominate the rookie scene. Natsuko is the only one of the bunch that isn’t a child, as she is 25 years old, but the other three range from 12 to 15. Arisu and Natsuko start the match and they lock-up, Natsuko pushes Arisu into the ropes but she gives a mostly clean break. Azumi attacks Natsuko from behind and they double team her in the corner, but Natsuko snapmares Arisu and kicks her in the back. Natsuko tags in Ruaka, she kicks Arisu back into her own corner which allows her to tag in Azumi. Front necklock by Azumi to Ruaka and she throws her into the corner, but Ruaka elbows her and they trade strikes. Scoop slam by Azumi and she applies a crab hold, but Ruaka crawls to the ropes and forces the break. Natsuko tries to help but Azumi boots her off the apron and hits a footstomp onto Ruaka’s back. Ruaka is already in her corner so she tags Natsuko, shoulderblock by Natsuko to Azumi and she hits two more for a two count cover. Natsuko goes for a leg sweep but Azumi blocks it and hits a DDT. Dropkicks by Azumi and she applies a satellite roll-up for a two count. Azumi tags in Arisu, elbows by Arisu but Natsuko elbows her back. Natsuko throws down Arisu by her hair, Irish whip by Natsuko but Arisu rolls through it and hits a dropkick. Anther dropkick by Arisu but Natsuko hits a senton and tags in Ruaka. Big boot by Ruaka in the corner and she hits a second one, she goes for a scoop slam but Arisu blocks it. Natsuko comes in and hits a side Russian leg sweep on Arisu, big boot by Ruaka and she covers Arisu for two. Azumi comes in but Natsuko cuts her off, shoulderblock by Natsuko to Azumi but Arisu dropkicks her. Ruaka runs over and rolls up Arisu, but it only gets a two count. Back up, Reverse STO by Ruaka and she puts Arisu in a crab hold, but Arisu gets out of it and applies a jackknife cover for the three count! Arisu Nanase and Azumi win! For an opening rookie match this was fine. It felt longer than it really was, which is never a good sign, and it lacked a veteran to help tie things together as the tag in/out transitions were pretty lackluster. But the action itself was ok, and Ruaka and Natsuko appear to be coming along nicely. Nothing special but nothing offensive either. The dreaded Triple Threat Match is here. I say that because early card triple threats tend to be pretty pedestrian just by definition, as they aren’t long enough for a story to ever develop and all you can hope for is some cute spots. With Kris in the match I assume that will happen, and I am always happy to see Konami, who was trained by Kana. I am surprised that HZK and Momo weren’t swapped since HZK is older, this is a bit of a throw-away match for the Queen’s Quest member but not everyone can have a big match on every card. Kris Wolf immediately leaves the ring to sit in the crowd as the match starts, so HZK and Konami are alone in the ring. HZK and Konami trade holds until Kris suddenly returns to help Konami, they both kick HZK to the mat but Kris stops Konami when she goes for the cover. All three get back up and get into a triple knuckle lock, but HZK and Konami promptly kick Kris out of the ring. She returns and dropkicks Konami, but HZK dropkicks Kris back out and hits bootscrapes on Konami in the corner. HZK clubs Konami in the chest and covers her, but it only gets two. HZK goes off the ropes but Konami kicks her in the chest, running knee by Konami but that gets a two as well. Konami quickly goes for the cross armbreaker but Kris runs in and covers both of them for a two count. Enzuigiri by Kris to Konami and she hits a running knee in the corner, suplex by Kris but Konami kicks out of the cover. Kris goes off the ropes but HZK kicks her from the apron and snaps her neck over the top rope. Konami kicks HZK back to the floor and grabs Kris by the tail before hitting a release German. Buzzsaw Kick by Konami, but Kris barely gets a shoulder up. Konami applies a necklock but HZK breaks it up, she elbows Konami but Konami elbows her back and they trade shots. HZK punches Konami into the corner but Konami kicks her in the stomach, Konami charges HZK but HZK boots her in the head. HZK goes up top but Kris quickly runs in and covers Konami, so HZK has to hop back down to break up the pin. HZK goes off the ropes but Konami connects with a back kick, Konami charges HZK but HZK pulls down the top rope and Konami falls to the floor. Kris runs over and attacks HZK, she goes for a kick but HZK ducks it and applies the armtrap crossface. Bodyscissors by HZK, she rolls Kris around the ring before holding down her shoulders and getting the three count! HZK gets the win. This was actually a lot better than I was expecting. Still a shortish early card match, but the action was really solid and they worked together well. Konami looked great, you wouldn’t have guessed this was her first tour with Stardom as she had good chemistry with both wrestlers. Kris trying to get the win by sneaky means throughout the match added a wrinkle to it, and the spots all connected well without any awkward moments. Hard to recommend a match like this in a vacuum, but for where it was on the card/expectations I thought it succeeded. The last time I watched these two wrestle, the match had lots of effort but lacked a bit in execution. Here we are a few months later, both have more experience and are featured once again in the midcard. Saori is from Actress girl’Z and is probably the best wrestler on their roster, she has had some moderate success in Stardom but mostly is still in the rookie scene. Hiromi debuted the same time as Jungle Kyona but was quickly surpassed by her, she is probably a bit too old (for a new wrestler, not in the grand scheme of life) and small to move too far up the card, but she is a fun wrestler and popular with the crowd. Hiromi is all business here as they trade waistlocks, shoulderblock by Saori and she hits another, but Hiromi blocks the third with a drop toehold and dropkicks Saori near the ropes. Hiromi puts Saori in the ropes and dropkicks her a few more times, crab hold by Hiromi but Saori gets to the ropes for the break. Irish whip by Hiromi but Saori reverses it, dropkick by Hiromi but Saori fires back with a shoulderblock. Hiromi and Saori trade elbows, Saori wins the battle and gets Hiromi on her shoulders, but Hiromi slides off and stomps her to the mat. Hiromi goes off the ropes but Saori boots her and hits a sidewalk slam. Fisherman Suplex by Saori, and she covers Hiromi for two. Saori picks up Hiromi and hits a jumping knee in the corner, she goes for another one but Hiromi moves and schoolboys her for two. Elevated DDT by Hiromi and she hits a rebound bulldog out of the corner for another two count. Hiromi goes up top but Saori joins her before she can jump off, Hiromi slaps Saori back to the mat and hits a diving crossbody followed by La Magistral for two. Hiromi picks up Saori and applies a headlock, Saori punches out of it as Hiromi jumps up on the second turnbuckle, but Saori grabs her and hits rolling Fisherman Suplexes for a two count. Backslide by Hiromi, she charges Anou but Anou applies a backslide into a bridge for the three count! Saori Anou is the winner. This was a touch better than their last match. Maybe. There are just too many small things that Hiromi doesn’t do quite right, her offense can look awkward (such as the bulldog) and she telegraphs transitions (such as sitting on the turnbuckles for no reason so Saori could suplex her off). Saori is solid but isn’t experienced enough to cover for these types of issues, so the match was just rough around the edges. Both are still early enough in their careers that it isn’t the end of the world, but I don’t think either are quite ready yet to be elevated higher on the card than they are right now. This is like a super powered triple threat match. This wasn’t the plan, Momo Watanabe was supposed to challenge Mayu Iwatani for the High Speed Companionship, but when Mayu got sick they put her into this match instead. 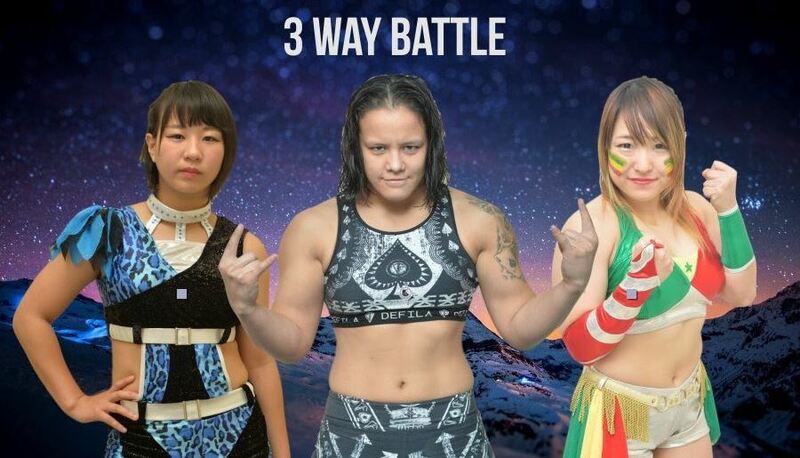 I’d have much rather seen Kyona vs. Baszler, but that’s life. One interesting probably unintentional story here is that Momo and Kyona used to be friends and partners before Momo joined Queen’s Quest, so we have that anyway. So this is a thrown together match that hopefully will still be entertaining. All three get into a knuckle lock to start, which Baszler wins with little issue and she puts both opponents in a headlock. Baszler locks both their arms before stacking Momo and Kyona in the corner, but both avoid her charge. Momo dropkicks Baszler but when Kyona goes after Baszler she is intercepted by a Momo dropkick. Momo quickly regrets this as Baszler kicks her repeatedly in the leg before a kick to the chest sends Momo to the mat. Baszler charges Momo but Momo dropkicks her, she charges again but she is caught in the ropes and Momo dropkicks her out of the ring. Kyona gives Momo a couple hard shoulderblocks but Momo gets away from her and kicks Kyona in the chest. Kyona kicks her back and applies the airplane spin before slamming Momo to the mat. Kyona picks up Momo and spins her into the returning Baszler, she puts them both into the corner and hits a body avalanche. Kyona goes for a face crusher on Baszler but Baszler slams on the breaks and hits a backdrop suplex. Baszler tries to pick up Kyona but Kyona flops to the mat, she finally gets her up as Momo gets on the second turnbuckle, but Baszler moves and Momo missile dropkicks Kyona on accident. Baszler charges Momo but Momo pulls down the top rope and Baszler lands out on the floor. Momo goes up top but Kyona avoids the avalanche Somato, hard shoulderblock by Kyona and she gets a two count. Momo and Kyona both go for backslides, Baszler comes back in the ring but she eats a double dropkick. Kyona and Momo go off the ropes to do their old double team move, but Kyona instead hits a lariat onto Momo. Baszler punches Kyona, Momo tries to hit Baszler but she hits Kyona by accident. Double lariat by Baszler and she hits jumping knees on both Kyona and Momo in opposite corners. Baszler grabs Momo and suplexes her onto Kyona, double cover by Baszler but they kick out. Vertical suplex by Baszler to Momo, but Momo gets a shoulder up. Baszler kicks Momo and hits a dragon screw, she applies a kneelock but Kyona goes up top and hits a body press onto Momo, she covers her but Baszler breaks it up by picking her up and hitting rolling gutwrench suplexes. Cover, but Kyona kicks out. Baszler picks up Kyona and goes for the Waterwheel Drop, but Kyona slides away and goes off the ropes as she tries to lariat Baszler over. It doesn’t work, high kick by Baszler and she goes off the ropes, but Kyona finally does manage to lariat Baszler down. Cover by Kyona, but Momo breaks it up by hitting a Somato onto Kyona for a two count of her own. All three are slow to get up, but as they do Baszler hits a spear on Momo. Baszler picks up Kyona, Momo charges them but Baszler suplexes both of them to the mat. Baszler puts Kyona into a sleeper, once Kyona is out of it she spins her again and hits the Waterwheel Drop. Cover by Baszler and she gets the three count! Shayna Baszler wins! Business has picked up in a hurry, as we are now in the ‘championship’ phase of the evening. Kay Lee Ray and Nixon Newell both hail from Europe, even though both are young they have a lot of experience between them and are top notch talents. Kairi and Yoko have been teaming since October and won the tag team championship in December, this is their first defense of the titles. Even though they are a new team, Kairi and Yoko are two of the top wrestlers in Stardom and have meshed together well; they have quickly become the top team in the promotion after Thunder Rock and JK Green both broke up. This is Kay Lee Ray’s third attempt at winning a title in Stardom. Kay Lee Ray and Nixon attack Kairi and Yoko during the customary handshake but the champions quickly take back over. The challengers recover as Nixon picks up Kay Lee Ray so that Kay Lee Ray can kick both of their opponents and they both then hit jumping lariats. Kairi is thrown into the corner but she slides out onto the apron, Yoko comes in and she knocks both Kay Lee Ray and Nixon out of the ring. Kairi then goes up top and dives down onto the floor, but her opponents move and she lands on Yoko by accident. Nixon and Kay Lee Ray take Yoko and Kairi up on different sides of the stands, leading up to opposite balconies. Kay Lee Ray and Nixon then get onto their own balcony and dive down onto they opponents, they quickly sprint back to the ring while the referee starts his count. Kairi and Yoko are assisted back to the ring, Nixon stays in with Kairi so they appear to the the legal wrestlers as Nixon covers Kairi for a two count. Nixon tags in Kay Lee Ray, Kay Lee Ray stomps on Kairi and she hits a scoop slam for two. Nixon returns as the Kairi Beatdown continues, she briefly gets away but Nixon stops her from making the hot tag. Kicks by Nixon, she goes off the ropes but Kairi does too and she delivers the spear. Kay Lee Ray runs in but Kairi kicks her off and she finally makes the tag to Yoko. Kicks by Yoko to everyone but Nixon and Kay Lee Ray catch her with a double vertical suplex. She fires back with a double lariat, Yoko then picks up Kay Lee Ray and drops her onto Nixon for a two count cover. Yoko goes up top and connects with a missile dropkick to Nixon, she picks her up but Nixon headbutts her and tags in Kay Lee Ray. Kay Lee Ray chops Yoko into the corner but Yoko delivers a head kick, they trade kicks until both of them fall to the mat. They both manage to tag out, Nixon superkicks Kairi and hits a pair of running elbows in the corner, but Kairi avoids the third. Rebound crossbody by Nixon out of the corner and she tags Kay Lee Ray, double superkick to Kairi and they connect with a catapult dropkick for two. Yoko comes in but eats a double headbutt, they go back to Kairi but Kairi drops them with a headscissors/DDT combination. Yoko puts Kay Lee Ray draped over the top rope, Kairi hits a diving footstomp onto her back and Yoko follows with a suplex. Dragon Sleeper by Kairi to Kay Lee Ray and they hit a Final Cut/Kick combination, Kairi goes up top but Nixon kicks her from the apron, Kay Lee Ray grabs Kairi and with Nixon they hit a Gory Bomb/Superkick combination. Shining Wizard by Nixon, Kay Lee Ray covers Kairi but Yoko breaks it up. Kay Lee Ray crouches so that Nixon can go for a Super Shining Wizard, but Yoko catches her in midair with a kick to the face. Sliding D by Kairi to Kay Lee Ray, Yoko then picks up Kay Lee Ray and she delivers the B Driller. A Diving Elbow Drop by Kairi quickly follows and she picks up the three count pinfall! Kairi Hojo and Yoko Bito are still the champions! If you are getting a case of déjà vu, don’t feel bad, as this match has happened before. These two faced off back in February of 2016 for the same championship, with Io winning in about 16 minutes. Viper wasn’t part of Stardom from July 2016 until this tour, but due to her past successes she was awarded another title shot. I mean it is Stardom, if a gaijin wrestler shows up and has her boots, she is qualified for a title shot. Io is starting to run out of challengers, but beating Viper will be no easy feat as the Scottish wrestler has both the size and the power advantage. Viper throws down Io after the bell rings to assert her dominance, elbows by Viper but Io kicks her away when she goes for an elbow drop. Io goes off the ropes but Viper decks her with a body block, Io gets Viper’s back but Viper gets away. Elbows by Io but Viper throws her into the corner and hits a body avalanche. Body press by Viper, but Io kicks out of the cover. Viper beats down Io for several minutes, she goes for a back bodydrop but Io kicks her in the head. Dropkick by Io, and Viper rolls out of the ring to re-group. Io goes off the ropes and sails out onto Viper with a tope suicida, she then puts a chair around Viper’s neck and slams it into the floor. With Viper’s head still in the chair, Io gets a running start and dropkicks it, she then gets on the top turnbuckle but Viper has recovered and hits her before she can jump off. Viper gets Io on her shoulders while standing on the apron before tossing her to the floor on top of other Stardom wrestlers. Viper then gets a running start on the apron and jumps down onto the crowd, hurting everyone in the process. They slowly get back into the ring, Viper goes off the ropes but Io catches her arm and applies an armtrap crossface. Tiger Feint Kick attempt by Io but Viper catches her and puts Io in an Argentine Backbreaker. Cover by Viper, but it only gets two. Viper picks up Io but Io wiggles out of it and lands on the apron, she goes for a swandive move but Viper elbows her. Io stands up on the apron but Viper hits a lariat, Viper goes out to the apron and she hits a running senton while Io is still lying on the apron herself. Viper slides Io back into the ring and hits a running crossbody, but Io kicks out of the cover. Io gets away from Viper and hits a missile dropkick, she goes for a German suplex but Viper gets out of it. Io knees Viper in the back and hits the Tiger Feint Kick, swandive missile dropkick by Io and she covers Viper for two. Running double knee by Io in the corner, she goes for the moonsault but Viper gets both feet up to block it. Io charges Viper in the corner but Viper moves, cannonball by Viper and she hits a Reverse Splash for a two count. Viper goes up top but Io avoids the diving bodypress, leaving both wrestlers down on the mat. They slowly recover and trade elbows, palm strike by Io and she dropkicks Viper in the knee. Io goes for a kick but Viper elbows her leg away and delivers a lariat. Michinoku Driver by Viper, but Io gets a shoulder up on the cover. Viper puts Io up top and joins her, she puts Io on her shoulders but Io reverses whatever she planned on doing with a Frankensteiner. Moonsault by Io, she picks up Viper and hits a delayed German suplex. Instead of holding onto it, she rolls through the hold and delivers a cross-arm suplex hold, picking up the three count! Io Shirai retains the championship! While this event overall didn’t reach the levels of the last Korakuen Hall event, it was still a solid show. The first two matches were a bit of a throwaway, although since I have a personal affection for Kris and Konami I enjoyed their match. Saori/Hiromi was pretty average, but the Baszler Triple Threat exceeded my expectations. Both of the last two matches were high end and I think would be even better pro shot, as some things are missed/don’t have the same impact when only seen from a ringside camera. So I’ll update this early next week once I watch the show on Samurai TV. Stardom had a great group of gaijins on this tour and the match quality reflected that, hopefully that trend continues down the road.